Last November we saw Samsung testing its homemade ARM Cortex-A9 Exynos chipset in tablets, when it was still codenamed Orion. The second generation of the Galaxy Tab slates, however, is coming with NVIDIA Tegra 2 chipsets, of which Samsung secured plenty with a huge order last year. When the Samsung Galaxy S II superphone was revealed, however, with a scorching 1.2GHz dual-core Exynos chipset, the company buried in the press release that it won't be shipping it with Exynos in all markets, but will rather have Tegra 2 in some. 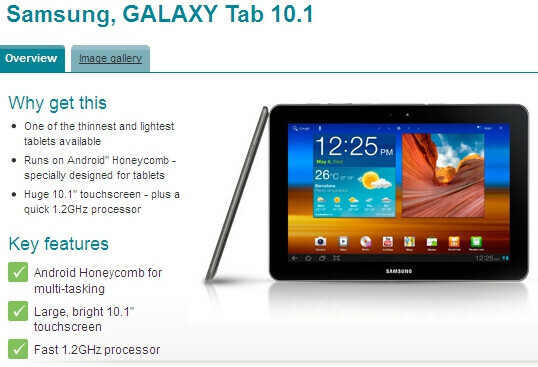 Could it be that the opposite is happening with the Samsung Galaxy Tab 10.1 for Vodafone UK? As you can see from the screenshot on the right, the availability update page on Vodafone UK's website lists the Galaxy Tab 10.1 as sporting a "fast 1.2GHz processor", which, if not a typo, could be the same Samsung Exynos that is in the Galaxy S II. Moreover, it seems that Vodafone will be getting the version with the metallic gray back, not the white one. 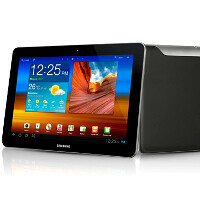 Samsung has a compelling reason to differentiate its newest tablet for Vodafone, after all. It launched its first iteration, called Samsung Galaxy Tab 10.1v exclusively on the Vodafone network, but went back to the drawing board to redesign it as the thinnest and lightest 10" tablet on the market, after it saw what Apple did with the iPad 2. Design alone obviously was not considered enough of an enticement by Samsung for Vodafone customers to prefer the newer version, so the company threw in a better chipset to sweeten the offer. After all, the old version was thick enough to accommodate an 8MP camera on the back, capable of Full HD video, whereas the new slim one has a 3MP shooter. Not that megapixels matter for picture quality much, but if it's the same 8MP shooter that is in the Galaxy S II, it's definitely worth having. There is no price tag or availability yet, but it's likely that the new Samsung Galaxy Tab 10.1 will cost more than the chubbier version in Vodafone's stores, otherwise why bother to differentiate it so much. Also, in the user's reviews for the new tab on that same page, there is a comment that this 3G/4G version of the Galaxy Tab 10.1 will sport a memory card slot, unlike its predecessor, or the Wi-Fi-only version. We'll know more about this mystery when the tablet appears on Vodafone UK, but it doesn't look like we will have to wait until August. Please let this be true! SD Card slot, USIM Slot, USB OTG, MHL, 8MP Camera and 3G Voice Call Capability! I won't really mind the price if all of these are present! Release it in the Philippines as well!! !